Zie hoe de stad tot leven komt op deze privétour die het ongelooflijke werk belicht van Mumbai's dabbawala's en Dhobis. Uw deskundige gids deelt inzicht en informatie over hoe de lunch-emmer mannen die vers geproduceerd voedsel van mensen thuis naar kantoren bezorgen met 100 procent nauwkeurigheid. Dan zie je de traditionele wassers van Dhobis - Mumbai - de kleren van de klant wassen in de enorme open lucht. Deze unieke tour toont twee van de meest interessante beroepen van de stad en biedt inzicht in het dagelijks leven van de lokale bevolking in deze bloeiende stad. We had a fantastic time on this our. Our guide Mr Arun was an absolute pleasure to spend the morning with. He was really informative explaining many aspects of the way of life in Mumbai in a short 3 hour tour. We caught a train, watched the lunch box men deliver the lunches and visited a working laundry slum area. The people there were really welcoming to tourists. Would highly recommend booking this tour especially if time is limited. 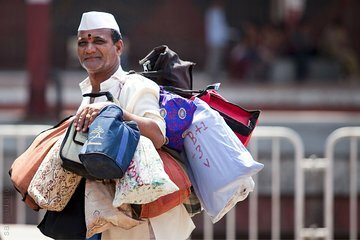 A uniquely Mumbai phenomenon, watching the army of Dabbawalas pouring out of Churchgate Station with their crates load with tiffin boxes for hungry office workers was one of the most amazing spectacles we’ve ever witnessed. It’s truly mind-blowing the order and accuracy in which the dabbawalas perform their jobs. When we were finished at Churchgate, we then hopped on the local train to Dhobi Ghat to watch the huge outdoor laundry facilities dating back to English rule. Another mind blowing site to see, there are thousands of families hand washing tons of uniforms, bedsheets, and more for customers all around Mumbai. Our guide did a great job of telling us not only about these two experiences, but about the history of Mumbai too.